Carole Allen is graphic designer, surface designer, and potter. Early in her career she worked with Polaroid film, exhibiting SX-70 and 8x10 images at Polaroid, and as a founding member of the original co-op Gallery Naga. For the past twenty years she has focused on ceramics, studying with the late Makoto Yabe, and Lisa Dolliver of Earth Changes Pottery in Maynard Massachusetts. She has also attended workshops with other established ceramic artists like Deborah Schwartzkopf at Massachusetts College of Art, and London artist Carolyn Genders at LaMeridiana International School of Ceramics in Tuscany. After a long career as a freelance designer and art director in educational publishing, Carole is now involved in combining her two passions, graphics and crafts, through a new focus on surface design, applying her bold, nature-inspired graphic sensibility to both three-dimensional clay vessels and two-dimensional silkscreened fabrics. She continues to provide freelance graphic design service. 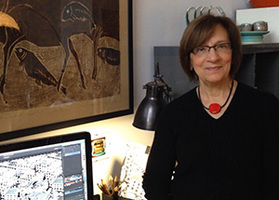 Carole studied art education and graphic design at Kent State University and textile design at Massachusetts College of Art and Design and Pattern Observer.